Sole Proprietorships. A sole proprietorship is any business with one owner which has not been set up as a limited liability company or corporation. This is the simplest form of business organization, and begins as soon as the owner opens for business. Decisions are managed by the owner and the process of recognition is quite simple. The sole proprietorship, however, does not protect its owner’s assets. Any action taken by a sole proprietor or an employee can create liability for the sole proprietor. Profits from the business count as personal income, and must be reported by the owner to the IRS. In short, the owner reaps all the benefits of owning a business, but has no protection against possible hazards. Partnerships. There are two major forms of partnership, a general partnership and a limited partnership. In a general partnership, two or more persons are co-owners of a business. They all participate in management of the business, and all are personally liable for any obligation incurred by the business. Partners are legally bound by any business-related action taken by another partner. All income is split and reported by the general partners as personal income. In a limited partnership, there must be at least one general partner responsible for management and at least one limited partner. The limited partner may contribute capital but is not involved substantially in managing the business. A general partner is liable personally for business obligations, but a limited partner has limited liability and can only be held responsible to the degree of their capital investment. Limited partnerships must be registered with your state’s secretary of state. The filing process can be extremely complicated. While partnership is still flexible and allows a business owner to share the responsibilities of management, it raises the question of trust, since partners are liable for each other’s actions. All partners must also consent if one partner wishes to sell or transfer their interest in the partnership. 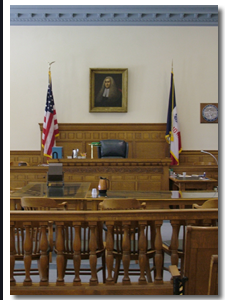 Contact an Iowa corporate / business lawyer representing clients in Clarion, Iowa today to schedule your initial consultation. Limited Liability Companies. A limited liability company (LLC) uses elements of corporations as well as partnerships in its organization. Generally, your state’s secretary of state must receive filed papers to create an LLC. In most states, one person can form an LLC. The filing also requires a written agreement which details the rights and responsibilities of all LLC members. LLC owners only risk money which they have invested. An LLC’s debts can legally only be paid using the LLC’s assets. The owners are therefore protected against personal liability. However, LLC owners report their share of profits and losses as personal income; the LLC is not a taxable entity. An LLC can be very complex to set up. meeting of the board of directors. You must issue corporate ownership stock.